Are you looking for a switch with better pay? Or Have you already started preparing for your next interview? Imagine the interviewer sittnig in front of you and asking the questions. You might have good hands-on experience with the technology or you might even be the Star of the Month in your company. But as you already know, when it comes to the IT interviews, our skill and knowledge alone are not sufficient. We need to have a solid plan with strong command on what questions are frequently asked, most important and how to answer them to the point, short and crisp. It is high time to brush up your knowledge and skills by knowing Exactly what kind of questions will be asked in that interview and the most suitable answers to them. This book was written by someone who worked and have knowledge on multiple technologies and also switched multiple top MNCs in career. If you want to be confident to crack the next interview, get this book and prepare well. 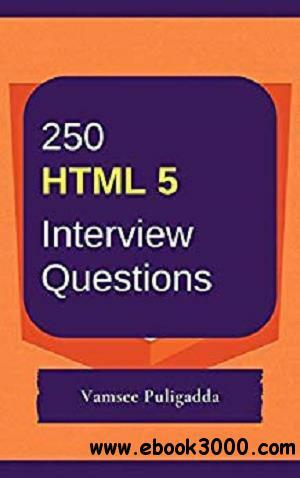 250 most frequently asked and important HTML 5 interview questions and answers.